for layout designs that revolve, rotate, or generally go around in circles. In this layout design a rotating table — pretty much an oversized turntable or lazy susan — is nearly the entire layout! 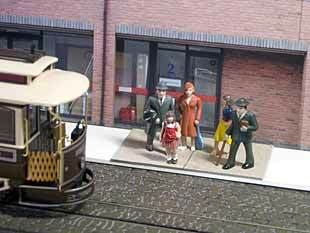 The secret is that the turntable has two scenes located on either side of a central backdrop. One is a source of material supply — like a mine, a quarry or a lumber landing; the other is a consuming industry, like a power plant, rock crusher or sawmill. This is an old theatrical trick often used to quickly change out stage sets. 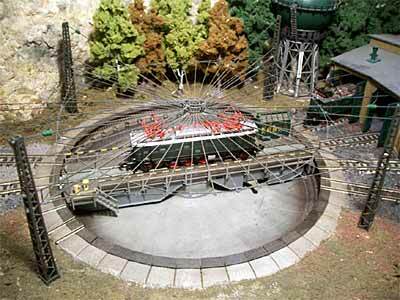 Used on a model layout, it lets you have an entire railroad in just one rotating circle (plus a cassette-type fiddle track)! You can build this layout in almost any scale — just make sure the turntable holds at least two standard-length cars or wagons. In O scale, the table would be around 24in (600mm) in diameter; in N, 6in (150mm) would do the trick! 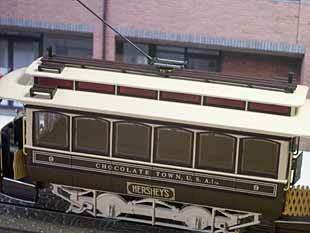 Using shorter cars or narrow gauge stock would let you reduce the diameter by a few inches in any scale. In the position shown, with the power plant “onstage,” your switching loco will couple onto two empty cars that were delivered yesterday. The loco backs onto the concealed cassette, and the table slowly turns to bring the mine into view. The loco removes two loaded hoppers from beneath the tipple, backing onto the cassette where a Giant Hand removes the cars and replaces them with two empties. The loco pushes two empties under the tipple. You may want to arrange an automatic loader mechanism that will “fill ’em up” before the audience’s eyes. In any event, the loco again retires to the cassette, the table turns, and when the power plant again appears our trusty switcher pushes two loaded hoppers over to the boiler house coal pile. There are a number of ways to arrange to dump their loads — which to use is up to the builder. Have fun with this minimalist layout that offers considerable operating enjoyment ! Needless to say, this revolutionary idea could also be used in larger layouts, providing an entertaining addition to any line! There is almost no limit to this idea of rotating the layout. Perhaps you remember this design, shown in Scrapbook #49, where the train moves steadily clockwise along the track while the entire platform revolves counter-clockwise at the same speed! The uncanny result is that the train appears to stand still while the scenery moves steadily past! 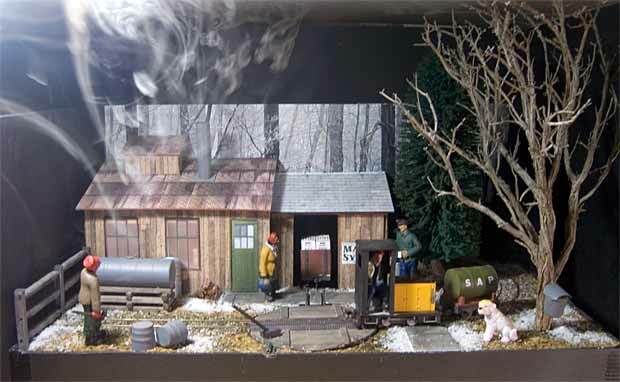 Roger Humbert, from Nice, France, created this display in HOe (HO scale running on 9mm gauge). Turntables can also be used for many more operating purposes than simply turning locomotives. Here, for example, Carsten Weye Jensen, from Holstebro, Denmark, has placed a double-slip switch on a sector table (which swings from side to side but does not revolve). The closeup view above is drawn for Z scale track. The result is a very flexible track plan for a small station in a very tiny space! Trace out the complex routings possible with this unique track arrangement, and you’ll see how cleverly the space has been used in this design. 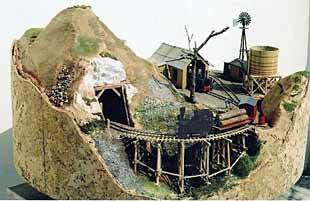 The layout works well in N or Z scales or could even be an HOe or HOn30 narrow-gauge line. A more familiar rotating turntable can also be made into an operation powerhouse by placing it in the main line and using it as a turnout replacement. This works best for backwoods narrow-gauge lines that are not heavily trafficked! 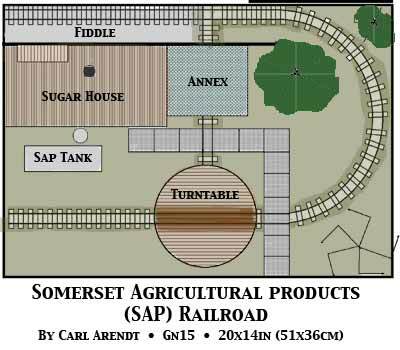 A good example is my latest layout, the Somerset Agricultural Products (SAP) Railroad, a Gn15 farm railway that hauls sugar-maple sap from the woods to the sugar house where it’s boiled down into maple syrup and shipped out to the nation’s breakfast tables. In this design, the turntable acts as a space-saving switch for the spur into the Annex, where the syrup is bottled and packed in cartons for shipment on the line. The turntable not only saves space, it is essential to operating the railroad! The sugar house. modeled after a typical Western Pennsylvania design, is shown in late February at the peak of the syrup season. The model includes a smoke unit in the chimney, which reproduces the typical cloud of steam that always surrounds a prototype sugar house. Outbound trains disappear into the woods behind the backdrop (aka the Fiddle Yard). Even “normal” turntables can add some extra oomph to the layout if they’re treated in an unusual way. A good example is this “spider web” of overhead lines created by Ignacio O’Callaghan, from Barcelona, Spain. 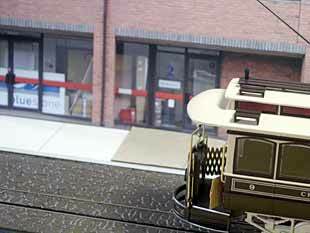 Ignacio built an electric line, complete with overhead catenary, in his N scale empire. A centerpiece of the action is this turntable, which has overhead contact wires at every possible position that might be needed by any locomotive. The visual result, one might say, is electrifying! Now let’s look at a different kind of rotation. This layout uses rotation along a lengthwise (longitudinal) axis to “flip” scenery that’s built on the top and the bottom of the table. The Drumm Harbor Railroad depicts operations from a car ferry to an industrial district and conserves real estate by having both ends of the line occupy the same space! The car ferry can hold four cars (two on each of two tracks). When the harbor side of the rotating tabletop is uppermost, the ferry is plugged in, and the road switcher pulls the cars in the normal manner. They’re hauled to the traverser (transfer table) at the right end, where each track also holds two cars. When the car ferry is empty and the traverser contains all four cars, there’s still an escape track for the loco and a runaround capability using the loco pockets at the right end. At this point the table top is “flipped,” bringing the industrial park to the top. The loco proceeds to switch the industries, removing previously spotted cars and replacing them with fresh ones from the ferry. At this point the crew can tie up at the traverser and retire for refreshments. While they’re occupied, the cars remaining in the industrial yard are surreptitiously removed, and the table top is flipped back to the car ferry scene. When the crew returns they continue bringing to the ferry the consists they’ve picked up at the industries. And so it goes. By using a reversible table top this three-square-foot pike can pack in a realistic simulation of a waterfront switching terminal and provide very satisfying operation. Again, this gimmick could easily be worked into a larger layout as a featured operation of one segment of the pike. This is not a new idea, it’s been mentioned in several model magazines over the years. But this is the first time I’ve seen it applied to a micro layout. Has anyone built one of these? Notice in the first photo that the passengers are waiting for the trolley to approach. In the center photo, the trolley has stopped between the passengers and the audience. And in the third photo, the trolley moves on, revealing that the passengers have disappeared — presumably they are riding away on the trolley! The truth, of course, is that the piece of pavement on which the passengers are securely glued, is pivoted in the center, and rotates. The bottom is painted to resemble exactly the sidewalk surface. (In this photo sequence, I’ve made the passengers’ platform very obvious, so it’s easy to see what’s going on. In an actual layout, you would want to have the sidewalk exactly match its surroundings, with the edges disguised as expansion joints.) The illusion can be uncanny — using a revolutionary device to suggest life and action in a model layout! Give you any ideas? Let me know about them!